1. Department of Entomology and Plant Pathology, Auburn University, Auburn, AL 36849, USA. 2. Department of Entomology, China Agricultural University, Beijing, China. 3. Genomics and Sequencing Laboratory, Auburn University, Auburn, AL 36849, USA. The expression of some insect P450 genes can be induced by both exogenous and endogenous compounds and there is evidence to suggest that multiple constitutively overexpressed P450 genes are co-responsible for the development of resistance to permethrin in resistant mosquitoes. This study characterized the permethrin induction profiles of P450 genes known to be constitutively overexpressed in resistant mosquitoes, Culex quinquefasciatus. The gene expression in 7 of the 19 P450 genes CYP325K3v1, CYP4D42v2, CYP9J45, (CYP) CPIJ000926, CYP325G4, CYP4C38, CYP4H40 in the HAmCqG8 strain, increased more than 2-fold after exposure to permethrin at an LC50 concentration (10 ppm) compared to their acetone treated counterpart; no significant differences in the expression of these P450 genes in susceptible S-Lab mosquitoes were observed after permethrin treatment. Eleven of the fourteen P450 genes overexpressed in the MAmCqG6 strain, CYP9M10, CYP6Z12, CYP9J33, CYP9J43, CYP9J34, CYP306A1, CYP6Z15, CYP9J45, CYPPAL1, CYP4C52v1, CYP9J39, were also induced more than doubled after exposure to an LC50 (0.7 ppm) dose of permethrin. No significant induction in P450 gene expression was observed in the susceptible S-Lab mosquitoes after permethrin treatment except for CYP6Z15 and CYP9J39, suggesting that permethrin induction of these two P450 genes are common to both susceptible and resistant mosquitoes while the induction of the others are specific to insecticide resistant mosquitoes. These results demonstrate that multiple P450 genes are co-up-regulated in insecticide resistant mosquitoes through both constitutive overexpression and induction mechanisms, providing additional support for their involvement in the detoxification of insecticides and the development of insecticide resistance. Keywords: Permethrin induction, P450 genes, detoxification, insecticide resistance, Culex quinquefasciatus. Cytochrome P450s have long been of particular interest because of their critical role in the detoxification and/or activation of xenobiotics such as drugs, pesticides, plant toxins, chemical carcinogens and mutagens; and in metabolizing endogenous compounds such as hormones, fatty acids, and steroids [1, 2]. In many cases, the overexpressed P450 proteins and P450 activity that result from constitutive transcriptional overexpression of P450 genes in insecticide resistant insects have been shown to result in the enhanced metabolic detoxification of insecticides in insects [3, 4]. Overexpression of P450 genes has been linked to the development of resistance in many insect species, including Musca domestica [5-10], Culex quinquefasciatus [11-13], Culex pipiens quinquefasciatus , Drosophila [15, 16], Aedes aegypti , Anopheles gambiae , Helicoverpa armigera , Tribolium castaneum , Bemisia tabaci [21, 22], and Trialeurodes vaporariorum . In a recent study, Reid et al. used RNAseq methodology to conduct a whole transcriptome analysis of Culex quinquefasciatus in permethrin resistant mosquitoes and found that the overrepresented functional categories were mainly among the P450 genes, which may indicate that the overexpression of multiple P450 genes is a key factor governing the increased levels of detoxification of insecticides and insecticide resistance in Culex mosquitoes. Another interesting feature of some P450 genes is that their expression can be induced by both exogenous and endogenous compounds, a phenomenon known as induction. This is a major concern due to the enhanced metabolism of pharmaceutical drugs, insecticides and endogenous compounds [3, 4, 25]. Many studies have suggested that the phenomenon of induction of P450s in insects plays a critical role in the metabolism of plant toxins and may also facilitate the adaptation of insects to their host-plants [26-32]. There is also evidence to suggest that the P450 induction mechanism is involved in the detoxification of insecticides and xenobiotics in insects species such as Diabrotica virgifera virgifera , Drosophila melanogaster , Musca domestica [6, 35], Plutella xylostella , Aedes aegypti [37, 38] and Culex quinquefasciatus . Induction of one or more P450 genes has been proposed as a potential factor that results in insecticide resistance in these insects and both constitutively increased expression and induction of P450s are thought to be responsible for increased levels of detoxification of insecticides [33, 39, 40]. Moreover, variations in the induction levels of P450 genes are likely to exist between different species, development stages, and insecticide susceptible or resistant strains, and are thought to be responsible, in part at least, for the selective toxicity of insecticides, the development of resistance to insecticides, and the selection of host plants by insects . The mosquito Culex quinquefasciatus is a primary vector of West Nile encephalitis, eastern equine encephalitis, Saint Louis encephalitis, and lymphatic filariasis pathogens [41-44]. Pyrethroids such as permethrin are currently the most widely used insecticides for the indoor control of mosquitoes worldwide and the only chemical recommended for the treatment of mosquito nets, the main tool for preventing malaria in Africa . Nevertheless, the development of resistance to insecticides, especially to pyrethroids, in mosquito vectors has become a global problem [46-51]. Our previous studies on whole transcriptome analyses of insecticide resistance  and genome analyses of cytochrome P450s and their expression profiles  in insecticide resistant mosquitoes have identified multiple up-regulated P450 genes in Cx. quinquefasciatus that may be responsible for the development of resistance to insecticides such as permethrin. In the current study, the induction profiles of multiple up-regulated P450 genes identified in highly resistant mosquitoes HAmCqG8 and MAmCqG6 have been examined to further test the hypothesis that both induction and constitutive overexpression of P450s are involved in insecticide resistance by increasing the overall expression levels of P450 genes. Three strains of Culex quinquefasciatus were used in this study. The insecticide susceptible S-Lab strain was obtained from Dr. Laura Harrington (Cornell University) and used as a reference strain for comparing the resistance levels to permethrin among the different strains. HAmCqG8, the 8th generation of permethrin-selected offspring of HAmCqG0, a field resistant strain collected from Madison County, Alabama, USA , has exhibited a 2700-fold level of resistance  and MAmCqG6, the 6th generation of permethrin-selected offspring of MAmCqG0, a field resistant strain collected from Mobile County, Alabama, USA , has a 570-fold level of resistance compared with the susceptible S-Lab strain . HAmCqG0 and MAmGqG0 were collected from sites located >600 km apart in the state of Alabama, USA. All the mosquitoes were reared at 25±2℃ under a photoperiod of 12:12 (L:D) h , and fed blood samples from horses (Large Animal Teaching Hospital, College of Veterinary Medicine, Auburn University). Our previous study revealed a clear concentration dependent response of P450 genes to permethrin treatment in Culex mosquitoes, with maximum levels of induction of P450 genes at a permethrin concentration of LC50 . Accordingly, in the current study the induction of P450 genes in response to permethrin was determined by treating ~1000 late 3rd instar larvae of each of the three Culex mosquito strains with permethrin at their respective LC50 concentrations (0.005 ppm, 0.7 ppm, and 10 ppm for the S-Lab, MAmCqG6, and HAmCqG8 strains, respectively). The surviving mosquitoes were collected for RNA extraction 12, 24, 48 and 72 h after permethrin challenge and their expression of the P450 genes was examined. Control mosquitoes exposed to 1% acetone were collected at the same time points as their permethrin treatment counterparts. The experiments were repeated three times. The total RNA was extracted from the surviving permethrin treated and acetone treated (control) mosquitoes using the acidic guanidine thiocyanate- phenol-chloroform method . The DNA was removed from the total RNA (5 µg) of each mosquito sample using DNase (TURBO DNA-free, Ambion) and the DNA-free total RNA (0.5 mg per sample) reverse-transcribed to cDNA using Transcriptor First Strand cDNA Synthesis kit (Roche) and a random hexamer primer following the manufacturer's instructions. The quantity of cDNA was measured by a spectrophotometer prior to qRT-PCR. Each experiment was repeated three times with RNA preparation and cDNA synthesis. The induction of P450 gene expression was performed with the SYBR Green master mix Kit and ABI 7500 Real Time PCR system (Applied Biosystems). In this study, we tested 19 and 14 P450 genes that were over-expressed in the larvae of resistant HAmCqG8 and MAmCqG6, respectively, as reported by Yang and Liu . Among these P450 genes, 4 P450 genes (CYP6P14, CYP4C52v1, CYP9AL1, and CYP9J45) were overexpressed in both HAmCqG8 and MAmCqG6 strains (Yang, et al. 2011) and tested for their induction in both HAmCqG8 and MAmCqG6 strains. Other two P450 genes, CYP9J34 and CYP9M10 that were also overexpressed in HAmCqG8 and MAmCqG6 strains, were only tested in in MAmCqG6 because the induction of these two gens had been tested in by Liu, et al. in HAmCqG8. Each qRT-PCR reaction (25 μL final volume) contained 1x SYBR Green master mix, 1 μL of cDNA, and a P450 gene specific primer pair (Table 1) designed according to each of the P450 gene sequences as described previously  at a final concentration of 3-5 μM. All samples, including the A 'no-template' negative control, were performed in triplicate. The reaction cycle consisted of a melting step of 50ºC for 2 min then 95°C for 10 min, followed by 40 cycles of 95ºC for 15 sec and 60ºC for 1 min. Specificity of the PCR reactions was assessed by a melting curve analysis for each PCR reaction using Dissociation Curves software . Relative expression levels for the P450 genes were calculated by the 2-ΔΔCT method using SDS RQ software . The 18S ribosome RNA gene, an endogenous control, was used to normalize the expression of target genes [9, 57]. Preliminary qRT-PCR experiments revealed that the 18S ribosome RNA gene expression remained constant among all 3 mosquito strains, so the 18S ribosome RNA gene was used for internal normalization in the qRT-PCR assays. Each experiment was repeated three times with different preparations of RNA samples. The statistical significance of the gene expressions was calculated using a Student's t-test for all 2-sample comparisons and a one-way analysis of variance (ANOVA) for multiple sample comparisons (SAS v9.1 software); a value of P≤0.05 was considered statistically significant. Significant overexpression was determined using a cut-off value of a ≥2-fold change in expression . Nineteen P450 genes that were over-expressed in the larvae of resistant HAmCqG8 strain  were tested in this study. The results of an earlier study revealed that although no significant induction was detected in the susceptible S-Lab mosquitoes for the doses (LC10, LC50, and LC90 for each strain) and time intervals (12, 24, 48, and 72h) tested, permethrin induced three P450 genes CYP6AA7, CYP9J34, and CYP9M10 in resistant HAmCqG8 mosquitoes, reaching a maximum at a permethrin concentration of LC50 . Based on these data, a permethrin concentration of LC50 for each mosquito strain was chosen for the current induction study and the expression of nineteen P450 genes in response to permethrin challenge in each of mosquito strains was characterized for various durations/time intervals (12, 24, 48, and 72h, see Materials and Methods). Examining the durations of P450 gene induction revealed no significant induction in the expression of all these P450 genes in the susceptible S-Lab mosquitoes that had been treated with either acetone alone (control) or with permethrin LC50 concentration (0.005 ppm) at any time points after the treatment (Fig. 1). In contrast, the results reported here revealed that seven of the 19 P450 genes that were up-regulated in HAmCqG8, CYP325K3v1, CYP4D42v2, CYP9J45, (CYP) CPIJ000926, CYP325G4, CYP4C38, CYP4H40, had their gene expression significantly induced by permethrin at an LC50 concentration (10 ppm; *p≤0.05), climbing to more than double that observed into their acetone treated counterpart, i.e., control mosquitoes (Fig. 1A-G). Interestingly, the expression of these seven genes was induced (≥2-fold) at varying levels for different times ranging from 12 to 72 h in permethrin treated HAmCqG8. The initial induction for these P450 genes was observed after 12 h permethrin treatment except for CYP325G4 and CYP9J45, where they occurred after 24 h permethrin treatment (Figs.1C, 1E). Except CYP4H40, where the maximum expression (3.3-fold induction) was reached 72 h after exposure (Fig. 1G), the remaining six P450 genes, CYP325K3v1 (Table 1, Fig. 1A), CYP4D42v2 (Fig. 1B), CYP9J45 (Fig. 1C), CYP325G4 (Fig. 1E), CYP4C38 (Fig. 1F), and the P450 gene, CPIJ000926 (un-named, Fig. 1D) peaked at induction levels of 3.9-, 8.8-, 2.5-, 3.1-, 2.1- and 2.9-fold, respectively, 48 h after permethrin treatment. When measured 72 h after treatment, the induction levels of CYP325K3v1, CYP4D42v2, CYP9J45, CYP325G4, and CYP4C38 had declined to the point where no significant induction (*p≤0.05) compared with acetone treated mosquitoes could be detected (Figs. 1A, 1B, 1C, 1E, 1F). In contrast, at 72 h after treatment CPIJ000926 and CYP4H40 retained their maximum induced levels (Figs. 1D and 1G). Up-regulated P450 genes and oligonucleotide primers used in qRT-PCR reactions for P450 gene expression/induction analysis. a The transcript ID number from the vectorbase of the Cx. quinquefasciatus genome sequence [http://cquinquefasciatus.vectorbase.org/] (Yang and Liu, 2011). b The annotation of the Culex P450 genes from http://drnelson.utmem.edu/CytochromeP450.html (Yang and Liu, 2011). c The ratio of the relative gene expression in permethrin selected strain HAmCqG8 compared with its parental strain HAmCqG0, data cited from Yang and Liu (2011). The induction of P450 gene expression in HAmCqG8 and S-Lab strains of Cx. quinquefasciatus following permethrin treatment. The relative expression of P450 genes in Culex mosquitoes following treatment with permethrin at their respective LC50 concentrations (0.005ppm and 10 ppm for the S-Lab and HAmCqG8 strains, respectively) were analyzed 12, 24, 48, and 72h after the permethrin treatment. The relative levels of gene expression shown along the Y axis represent the ratio of the gene expression in each treatment in comparison with that in acetone treated control mosquitoes (noting that the Y axis vary among the sub-figures). The experiments were repeated three times. The results are shown as the mean ± S.E. The significant difference was indicated by *(P≤0.05), **(P≤0.01), and ***(P≤0.001). A. CYP325K3v1, B. CYP4D42v2, C. CYP9J45, D. (CYP) CPIJ000926, E. CYP325G4, F. CYP4C38, G. CYP4H40. We examined the induction of a total of 14 up-regulated P450 genes in another resistant mosquito population, MAmCqG6 (Table 1)  following the same method as that utilized for HAmCqG8. 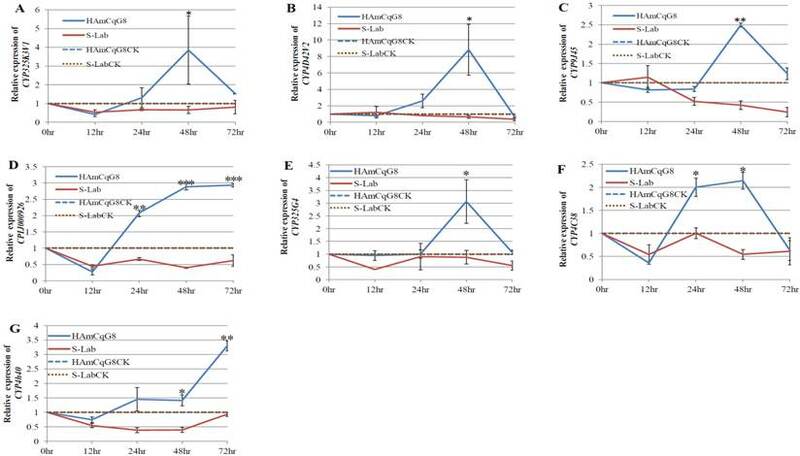 A permethrin concentration of LC50 (0.7 ppm) was used to treat MAmCqG6 mosquitoes and the expression of fourteen P450 genes in response to permethrin challenge was characterized at 12, 24, 48, and 72 h after permethrin treatment. Eleven of the 14 P450 genes known to be up-regulated in MAmCqG6 , CYP9M10, CYP6Z12, CYP9J33, CYP9J43, CYP9J34, CYP306A1, CYP6Z15, CYP9J45, CYPPAL1, CYP4C52v1, and CYP9J39, had their gene expression further induced by permethrin at an LC50 concentration (0.7 ppm; *p≤0.05) to more than 2-fold by permethrin compared to the acetone treated control mosquitoes (Fig. 2A-K). Once again, the expression of these eleven genes was observed to vary for times from12 to 72 h after permethrin treatment in MAmCqG6. Except CYP4C52v1, whose maximum induced expression (2.2-fold induction) reached at 12 h (Fig 2J), CYP9J43, which had two induced maxima (2.7- and 2.7-fold induction) at 24 and 48 h (Fig. 2D), the induction for the remaining nine P450 genes reached their maxima at 24 h and 72 h after permethin treatment. These results are a little different from those in HAmCqG8 mosquitos, where the induction of most of up-regulated P450s by permethrin peaked at 24 h after treatment. Significant induction levels of CYP9M10, CYP9J33, CYP9J45, and CYP9J39 (Figs. 2A, 2C, 2H, 2K) in the MAmCqG6 strain were found 24 h after permethrin treatment, with maximum induction levels of 2.5-, 4.1-, 2.7- and 2.0-fold, respectively. The expression of CYP6Z12, CYP9J34, CYP306A1, CYP9AL1 (Figs. 2B, 2E, 2F, 2I) reached 2.6-, 2.5-, 4.8-, and 3.4-fold levels of induction, respectively, 72 h after permethrin treatment in MAmCqG6. In contrast to the induction of P450 genes in HAmCqG8 mosquitoes, where there was no significant induction in the expression of P450 genes in the susceptible S-Lab mosquitoes treated with permethrin, several of the P450 genes identified in MAmCqG6 also showed some level of induction in S-Lab mosquitoes treated with permethrin at certain time points. A 1.5-fold lower level of induction of CYP6Z12 was identified 12 h after permethrin treatment in S-Lab mosquitoes (Fig. 2B), with no corresponding induction in permethrin treated MAmCqG6 However, the MAmCqG6did show significant induction of CYP6Z12 from 24 to 72 h after permethrin treatment and no induction was found in S-Lab at these time points. Low levels of induction of CYP9J33 and CYP9J34 were also detected in the susceptible S-Lab strain after 48 h permethrin treatment, though statistical significance was not achieved compared to the corresponding levels of induction in the resistant MAmCqG6 strain (Figs. 2C and 2E). Although induction of CYP9J43 was detected in the susceptible S-Lab strain at 12, 24, and 48 h time points after permethrin treatment, at levels 1.5-, 1.6- and 2.0-fold, respectively (Fig. 2D), the induction of CYP9J43 was more evident in the MAmCqG6 strain with levels of 2.7-, 2.7-, and 2.1-fold at 24, 48 and 72 h, respectively, after permethrin treatment. The expression of CYP6Z15 (Fig. 2G) and CYP9J39 (Fig. 2K) were both induced significantly in the susceptible S-Lab strain, with induction levels of 3.5-fold at 48 h and 4.9-fold at 72 h, respectively, after permethrin treatment. These results may suggest that some P450 genes are common to the response of both susceptible and resistant mosquitoes to permethrin whereas others are more specific, presenting only in resistant mosquitoes in response to insecticides. The induction of P450 gene expression in MAmCqG6 and S-Lab strains of Cx. quinquefasciatus following permethrin treatment. 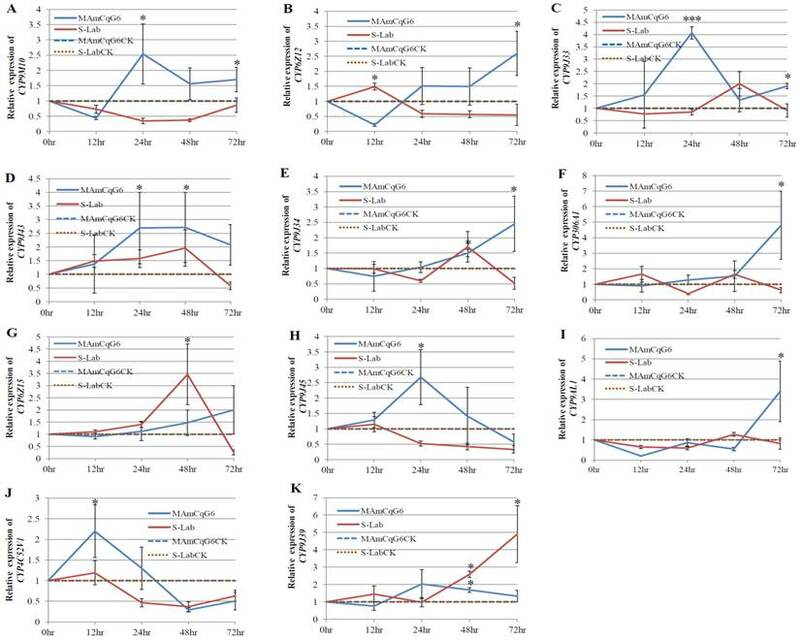 The relative expression of P450 genes in Culex mosquitoes following treatment with permethrin at their respective LC50 concentrations (0.005ppm and 0.7 ppm for the S-Lab and MAmCqG6 strains, respectively) were analyzed 12, 24, 48, and 72h after the permethrin treatment. The relative levels of gene expression shown along the Y axis represent the ratio of the gene expression in each treatment in comparison with that in acetone treated control mosquitoes (noting that the Y axis vary among the sub-figures). The experiments were repeated three times. The results are shown as the mean ± S.E. The significant difference was indicated by *(P≤0.05), **(P≤0.01), and ***(P≤0.001). A. CYP9M10, B. CYP6Z12, C. CYP9J33, D. CYP9J43, E. CYP9J34, F. CYP306A1, G. CYP6Z15, H. CYP9J45, I. CYP9AL1, G. CYP4C52v1, K. CYP9J39. Increased levels of P450 gene expression are known to result in increased levels of total P450s and the P450 activities responsible for insecticide resistance [3, 5, 6, 8, 9, 34]. It has been suggested that both constitutively increased expression and induction of P450s in insects are responsible for increased levels of detoxification of insecticides, evolutionary insecticide selection, and the ability of insects to adapt to changing environments [1, 6, 33, 39, 40]. In a previous study , a whole transcriptome analysis of P450 gene expression analysis was used to identify multiple P450 genes that are constitutively overexpressed in insecticide resistance resistant Cx. quinquefasciatus. Liu et al. further characterized the constitutive overexpression and induction of CYP6AA7, CYP9J34, and CYP9M10 by permethrin in HAmCqG8 Culex mosquitoes, revealing that multiple P450 genes are up-regulated in insecticide resistant mosquitoes through both constitutive overexpression and induction mechanisms, thus increasing the overall expression levels of P450 genes. The current study developed this further by characterizing the induction of P450 genes that were constitutively over-expressed in resistance through a whole genome analysis of resistant Cx. quinquefasciatus . Two different highly resistant Culex mosquito strains, HAmCqG8 (19 P450 genes) and MAmCqG6 (14 P450 genes), were examined to test our hypothesis that insecticide resistant mosquitoes may be uniquely resistant to insecticides due to their ability of both constitutive overexpression and induction of P450 genes , and also allow us to test whether this induction is a common feature for different populations of mosquitoes. We found that seven and eleven P450 genes were significantly induced in the resistant HAmCqG8 and MAmCqG6 mosquito strains, respectively, in response to their corresponding LC50 concentrations of permethrin. We also found that three P450 genes, CYP9J34, CYP9M10, and CYP9J45, were induced in both HAmCqG8 and MAmCqG6. These findings are not only consistent with our previous identification of P450 gene expression in resistant mosquitoes  but also support our contention that the induction and constitutive overexpression of these P450 genes plays an important role in the detoxification of insecticides and the development of insecticide resistance as a result of the overall increased expression levels of multiple P450 genes in resistant mosquitoes. We restricted the induction response to permethrin treatment here because this is the insecticide that these mosquitoes are resistant to. P450 gene induction in mosquitoes follows a resistance-specific pattern, where mosquitoes can become resistant to an insecticide through increased expression of their P450s as a result of exposure to that insecticide. Similar results have been reported in Drosophila melanogaster, where CYP6g1 and CYP12d1 mRNAs were induced in DDT resistant strains post-exposure to DDT and the expression patterns of these P450 genes varied across DDT resistant strains . Studies by Zhu et al. [9, 35] have also indicated that several P450 genes are up-regulated in insecticide resistant house flies, with a very similar pattern to that observed in studies in mosquitoes. Taken together, these findings strongly suggest a common mechanism for P450 induction in response to detoxification-mediated insecticide resistance in a number of different insect species. The results from the current study reveal that different sets of P450 genes are involved (overexpressed) in different resistant strains (HAmCqG8 and MAmCqG6). This phenomenon has also been reported among different pyrethroid resistant strains of house flies . It has been suggested that the molecular basis of P450-mediated detoxification may be different among different house fly strains [10, 60] and resistant mosquito strains (HAmCqG8 and MAmCqG6) may follow the same pattern. This phenomenon has been hypothesized to arise as a result of the evolutionary plasticity of P450-mediated insecticide resistance [10, 60]. However, we found that CYP9J45 was induced by permethrin in both the resistant strains of HAmCqG8 and MAmCqG6 and CYP9M10, which was found to be induced by permethrin and constitutively overexpressed  in resistant HAmCqG8, was also induced significantly in MAmCqG6 in response to permethrin when compared to the susceptible S-Lab strain. Moreover, the overexpression of CYP9M10 has also been reported in a resistant Culex mosquito strain in Japan , and has been further linked with pyrethroid resistance in Culex mosquitoes [14, 62]. The coincidence of the induction and constitutive overexpression of CYP9J45 and CYP9M10 in different resistant Culex mosquito strains/populations strongly suggests a common feature of these two P450 genes in pyrethroid resistance in Culex mosquitoes. It has been suggested that similar regulatory mechanisms may govern P450 constitutive overexpression and induction, and that both contribute to the development of insecticide resistance [27, 33]. Although the mechanisms of regulation for constitutive overexpression and for induction are not clear in insects, it has been reported that in mammals, the constitutive androstane receptor (CAR) and the pregnane x receptor (PXR) have been identified as key transcription factors (IFs) regulating phenobarbital (PB) induced transcription of P450s [25, 63, 64]. A recent study by Lin et al. reported that Drosophila hormone receptor-like in 96 (HR96), a single orthologue of CAR and PXR, can act as an activator regulating the PB induced transcription of cytochrome P450 CYP6D1 in house flies. Abass et al. reported that some P450 genes (CYP3A4, CYP2B6 and CYP2A6) in HepaRG cells could be induced by pyrethroids through both PXR and CAR, and PXP is predominantly activated by pyrethroids rather than other insecticides. Whether a similar mechanism is involved in the induction/overexpression of P450s in mosquitoes is questionable and requires further investigation. It has been suggested that the induction of CYPs is a complex phenomenon involving multiple DNA-binding elements in each P450 promoter, transcriptional factors, and the overlap of regulatory pathways . It will, therefore, be particularly interesting to further characterize transcriptional elements in the promoter region of P450 genes and regulatory factors involved in the regulation of both the constitutive overexpression and induction of the P450 genes implicated in the development of insecticide resistance in order to fully understand the molecular mechanisms involved. The project described was supported by Award Number R21AI076893 to N.L. from the National Institute of Allergy and Infectious Diseases, AAES Hatch/Multistate Grants ALA08-045 and ALA015-1-10026 to N.L. 45. Najera JA, Zaim M. Malaria vector control: insecticides for indoor residual spraying. WHO document WHO/C DS/WHOP ES/2001; World Health Organization, Geneva. Corresponding author: Dr. Nannan Liu, Department of Entomology and Plant Pathology, Auburn University, Auburn, AL 36849, USA. liunannedu or Dr. Xiwu Gao, Department of Entomology, China Agricultural University, Beijing, China.